'Spectacular!' 'Awesome!' 'Unique.' 'Beautiful.' 'Fun.' These are just a few of the words that have been used to describe the unspoiled natural setting for our vacation home, Sea Forest. Located on Cowpens, a small private island accessible by causeway, the house offers stunning views of marsh, creek and the Atlantic Ocean. The island itself, with fifteen homes including ours, is situated just behind Edingsville Beach, an uninhabited barrier beach just north of Edisto Beach. The setting is secluded, relaxing, and peaceful. 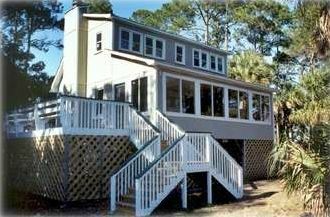 Our home is designed to maximize enjoyment of its beautiful marsh and ocean views and abundant wildlife. The main level has an open floor plan with living area, dining room, kitchen, and master suite. In the summer you may enjoy the cool ocean breezes, or if you prefer, the air conditioning. In the colder months, the fireplace adds to the cozy comfort provided by central heating. Large picture windows across the front and front-sides of the house provide unobstructed views of the ocean, creek and marshes. The outside deck provides a perfect seating area to enjoy the afternoon sea breezes while you watch the pelicans, great blue herons, egrets, wood storks and other shore birds fly overhead or feed in the marsh grasses a few feet away. The back screened porch provides for panoramic views of the beautiful creek, marsh and gorgeous sunsets while you enjoy the peace and quiet. The additional fireplace on the porch provides the luxury of a cozy fire to gather 'round on chilly afternoons or evenings with friends and family, even when it's raining outside! The master suite offers a large bedroom with a queen-sized bed, a deck overlooking the creek, and a bathroom with a walk-in shower. There are two bedrooms upstairs. One has a double bed and a small deck overlooking the creek and marsh. The other bedroom has a double and a single bed which is perfect for families with young children. There is also a fold-up cot for an additional guest. A covered fixed pier with floating dock is on the creek behind the house. The dock provides additional 360-degree marsh/creek views and access to the creek for small boats (kayaks, jon boats, etc. ), crabbing, fishing, and swimming, This is a wonderful swimming 'hole' and great for lazy afternoons spent relaxing in and on the water. There's a hammock to enjoy the breezes while you read or nap --- the perfect way to while away the hours on vacation. The creek is navigable for small boats even at dead low tide (about 2 feet of water at the dock at low tide), and provides easy access to Edingsville Beach, Botany Bay Beach, and Frampton Inlet. (OWNER SOMETIMES CAN ASSIST WITH LAUNCHING AND SECURING YOUR BOAT AT OWNER DOCK) Edingsville Beach has historic significance because it was the established beach community in the 1800's for the Edisto Island plantation owners until it was completely destroyed by the hurricane of 1893. For the serious beachcomber, pieces of fine china and old wine bottles from the old Edingsville community can still be found on this beach today. Both Edingsville and Botany Bay Beaches are literally covered with numerous seashells and fossils, including sharks' teeth, and these beaches are prime locations for swimming, walking, sunning, and surf fishing. It is requested by creek property owners that jet skis not be used on the creek. In addition to boat access to Edingsville Beach, one can walk from our home to the beach which is a distance of about a half mile through a private residential development. For other beach access, we also use the public path options at Edisto Beach. Sea Forest is located about five miles from Edisto Beach with its restaurants, gift shops, grocery and hardware stores, golf course, tennis courts, churches, and special community events. It is about a forty-five minute drive south of romantic Charleston, SC, known for its outstanding gourmet restaurants, chic King Street shops, and historic sites and homes. Yes, Sea Forest really is 'unique!' It's a comfortable home in an incredibly beautiful setting. There is lots to do and see, and yet it's so relaxing that you might not want to do anything at all! The Lumpkin Family has owned this property since purchasing the original home in 1953. That home was destroyed by fire in 1971. This newer home was built in 1980 and has been re-modeled twice since then. We love using it as a year round retreat from the too-hurried pace of our daily lives. The mystery and magic of Edisto Island has always been a draw for us. The privacy and isolation of our own Cowpens Island community has been particularly rich for our lives. The secluded location, along with the entertainment provided by nature and the spectacular views, provides an oasis conducive to relaxation. Here we can enjoy the truly rich pleasures of life. Some of the things we enjoy most are the peace and quiet...the birdlife (from painted buntings to pelicans)...the wildlife (porpoises, otters, deer) shelling...swimming... boating...fishing...crabbing...reading...napping. OWNER CAN SOMETIMES ASSIST WITH LAUNCHING AND SECURING YOUR BOAT AT THE DOCK--Jon boats and boats under 16' are ideal for this creek. Master bath with shower. Bathroom 2 with bathtub/shower. Two central air conditioning systems allow the living area and the bedrooms to be cooled/heated separately. Front loader uses 'high efficiency' detergent. Dryer, too, of course. 2 Cars can fit under house if necessary but low ceiling. We have a Keurig coffee maker as well as a traditional Mr. Coffee type. Plates, bowls, cups, wine glasses, glasses, silverware, cutting knives, cutting boards, large boiling pot, etc, etc. Our kitchen is open to the living area, allowing the cook to continue being part of whatever is going on, while enjoying the beautiful views. 42" Flat Screen with Dish Satellite includes SEC Sports channels and ESPN Sports channels. 100 Channels available on Dish satellite. 6 speakers located around deck and on the screen porch. The sound can be heard inside only, inside and outside, or outside only. We have traditional board games as well as puzzles and group games such as Balderdash. Sliding glass doors from master bedroom to deck/balcony on 1st floor. Balcony Outside sliding doors on 2nd floor bedroom. Dock comes with the house. Kayaks can be rented from local vendors. Bicycles are available for rent from a separate source. Ask for details. Expansive decks on front, side and back for views. Please note that linens are not included. We will provide them for an additional fee of $150. 1000-Gallon Reverse-Osmosis Fresh-Water System. Birdwatching, Wonderful Marsh/Nature Scenes for artists who paint and for nature photographers. Fishing, crabbing, creek and ocean swimming.